IT’S Hampshire’s own answer to Stonehenge. Alone in a rural setting stands an eerie circle of stones, each painstakingly positioned in such a way as to celebrate the earth’s natural calendar. But, unlike the world-famous monument on Salisbury Plain, it took just one person to build this modern version. The 24 stone towers are made out of fly-tipped waste and they have been erected over a decade by a man fascinated with Britain’s ancient history. Bryan Raines started his Millennium Circle in 2000, each year arranging the monuments in line with specific times in the year such as summer and winter solstice and the spring equinox. The circle, in Bryan’s field near Awbridge Village Hall, surrounds a barrow constructed of soil. The 55-year-old conservationist believes the site lies on an ancient ley line running from the Isle of Man to the Isle of Wight. Bryan, who lives in Michelmersh, said: “I was in the process of collecting builder’s rubbish that I had accumulated and I thought I would use it for a stone circle. “Some of the stones are between five and six feet high but, unfortunately, cows keep knocking them over. “I’ve ended up with a sort of 24-hour sundial. It’s a good 50 metres across. Some people believe sites of geographical interest and ancient monuments and megaliths are connected by straight lines, known as ley lines. Their existence was suggested in 1921 by the amateur archaeologist, Alfred Watkins, in his book, The Old Straight Track. Those who believe in them think that the lines and their intersection points resonate a special psychic or mystical energy. Watkins believed that, in ancient times, when Britain was far more densely forested, the country was crisscrossed by a network of straight-line travel routes on which prominent landmarks were used as navigation points. Since then, ley lines have become the subject of magical and mystical theories. Two British dowsers, Captain Robert Boothby and Reginald A. Smith, of the British Museum, linked the appearance of ley lines with underground streams and magnetic currents. 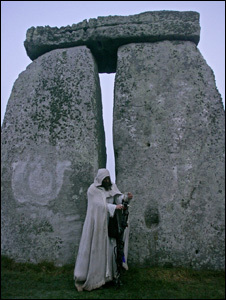 HisTOUries UK offer guided tours of Stonehenge and Avebury abd demonstrate the ancien art of dowsing.